1. Have your personal items ready to unload at security, and be sure to use bags that zip! Items can get tossled about quite a bit when they go through x-ray, and you don't want anything falling out of an open bag, particularly when you are scrambling to recover your personal items in a rush. I had the unusual experience of having my jacket get mixed in with the camera belonging to the woman behind me in line. The camera was causing a problem for some reason -- I imagine the battery - but I went merrily on my way, jacket in tow. Try to minimize extra accessories that will just get in the way, like belts, coins, and jewelry. 2. If you have are taking your toiletries on board and have remembered to put everything in a plastic baggy, you're on the right track, but don't forget to take it out of the suitcase or carry on and put it in the tubs that go through the x-ray machine. On our last trip, I had gone to all the trouble of packing my toiletries correctly, but caused a bit of commotion when I forgot to take the baggie out of the suitcase. Same for your laptop computer. Note: it seems they no longer remind you to remove these items separately. 3. Try not to check luggage. 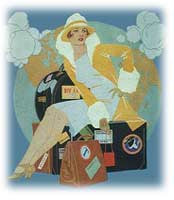 The New York Times had a recent article about jet setters and those who worked in the fashion industry who flew so much, to Europe and beyond, that they never checked luggage anymore. This is of course ideal, because you don't have to worry about retrieving your baggage, or having your luggage grabbed by someone else upon arrival. But you do have to pack the right things. Stick to clothes in basic colors like black and white, with a few key accessories for business, such as a pearl necklace or chic scarf, for women. One article of clothing that always takes up a lot of room are shoes, so try and take shoes that can double up both as everyday and special occasion wear. If you do have to check luggage and your suitcase is a common brand, try to personalize it somehow, by attaching a colorful sticker or tassle to one end. This is very important these days, when fewer airports are requiring passengers to show proof of ownership when they pick up their luggage. 4. In flight, make sure you have everything you will need for the duration of the flight, particularly if it is a longer flight exceeding several hours. You should also have everything you would need for an overnight stay in the event your luggage got lost. This includes: prescriptions, reading, laptop, lip balm, snacks, toiletries, etc. Also, it is important to screen out noise if you need to, so bring your Ipod and headphones. In case you don't like the movie choice, it's nice to bring your own, and there are many inexpensive dvd players now that make entertaining yourself fairly easy. I like to bring antiseptic wipes and an extra bottled water, in case there are any delays and the flight attendants can't serve refreshments for a while. 5. Be considerate of those next to you. How many times have the people sitting next to you started talking to you, when you really in the mood to just read or sleep? If you're in the mood to talk, don't assume your neighbors are as well. Once, my neighbor started telling me his life story, and I subtly sent the message that I wanted to rest by closing my eyes and leaning my head back. When that didn't work, I told him I'd catch up with him later and that I needed to sleep. Sometimes, the direct approach, like a direct flight, works best!